During World War 1, German spies will stop at nothing to spy on the allied war plans stored at Gibraltar. Bushrod Gentry: I thought they called you Stepping Woman. Mary Stuart Cherne: I been stepping all day. A genuine " sleeper "
This is simply a charming , funny movie . 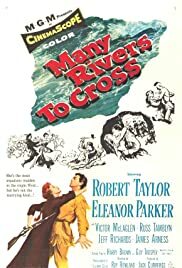 Robert Taylor is exceptionally good - as is the supporting cast in general. Well-made Western comedies seem few and far between . The movie was not well publicized upon its release as I recall , nor was it rated as top flight . It's hardly ever seen on television. The film can easily be described as wholesome - a rarity more today than back in the 50's . Its tone and style reflect the mood of the times. By all means , catch it if you can .